Too much milk on hand and a thick bunch of fresh celery gave me an idea. I started off making herbed cottage cheese using the milk, cumin and celery. I felt lazy and instead of draining it out and using a muslin cloth with a weight to make it into a block, I let the whey drain out in the colander. I ended up with a ricotta like texture. So voila cream cheese was born! this is an easy recipe and can be made using whatever herbs and spices you have on hand/prefer. 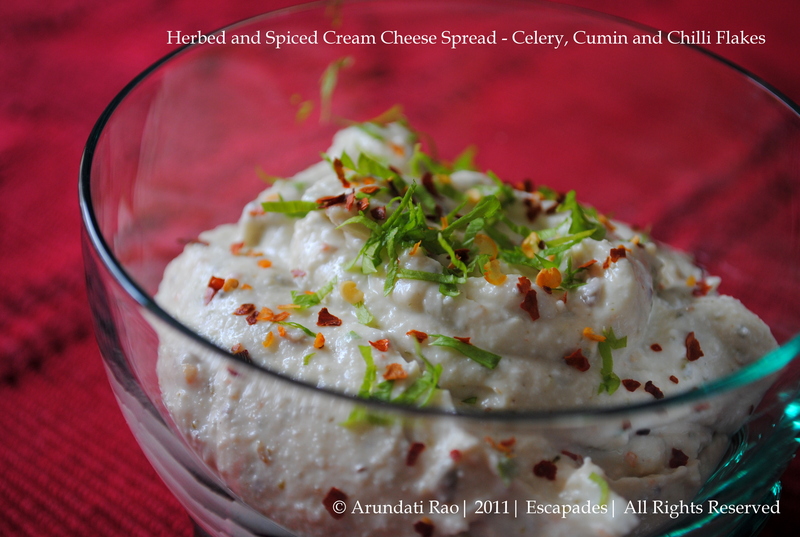 Use it with crackers/ breadsticks/ khakra/ vegetable crudites or as a spread for sandwiches. In a large saucepan, bring the milk to a boil, add the celery leaves and stalk, cumin. Reduce the heat and add the lemon juice/ vinegar and simmer for a few minutes till the milk curdles and the whey seperates. After about 15 minutes, keep a vessel underneath a cloth lined sieve and drain out the whey water from the curds. the whey water is high in nutrients and can be used to thin out gravies/ soups/ dal etc or to knead dough for rotis. You can keep this in the fridge for a few hours till all the water is drained out. when all the water has drained out, add the garlic pod and the ricotta to a blender and whizz till smooth and creamy. Add a few teaspoons of the whey if needed to get a creamy consistency. Remove into a bowl, add the reserved celery leaves and red chilly flakes and salt to taste and mix thoroughly. Chill till needed. This stays in the fridge for a couple of days if stored in an airtight container. Serve with crackers/ breadsticks or vegetable crudites. Use as a sandwich spread. I always go overboard at grocery stores when i see exotic herbs and buy bags/ bunches of them. the herbs sit in the fridge for longer than they need to and then get trashed because they have gone bad or wilted or blackened. 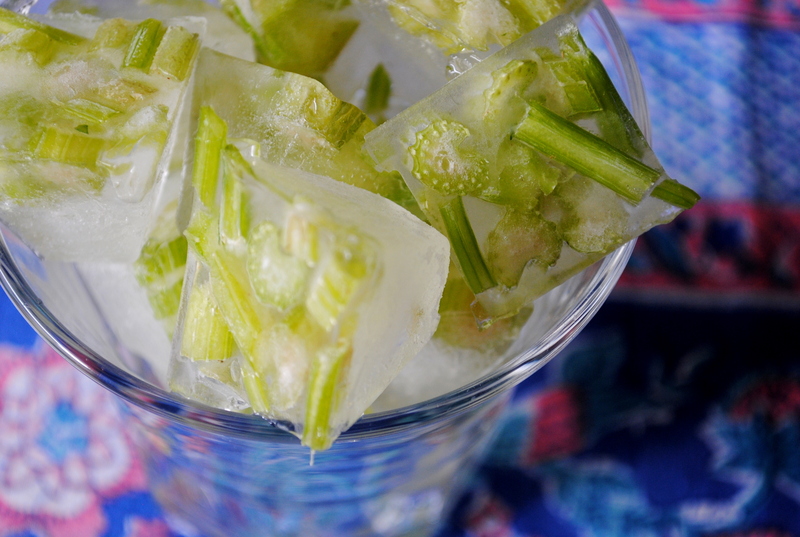 This time i chopped up all the celery stalks and put the chopped pieces into an ice cube tray. Filled it with water and froze it. Removed the celery ice cubes and stored them in a ziplock bag for later use. this way the herbs retain their colour and flavour. I plan to do this with all the herbs i now buy. Happy New Year dear girl! Its been ages since I came around here… Glad you are keeping this up :). Love the frozen herb cube idea! Oh ..amazing idea … the cubes look great.. , Like the cream cheese and the pics blew my mind.. !!. lovely. love the second idea… the cream cheese i will try..
Lovely idea to store herbs! Nice! I’ve been making dips like this, but with just yoghurt, strained through a muslin cloth. After straining I just add salt and whatever you feel like. Pepper, garlic, mint, chilli flakes – just about anything works. I love the way you have presented it!!! looks superb!